PostProcess Technologies announced today the launch of a new solution in their lineup of automated, intelligent post-printing solutions for additive manufacturing (AM). The new FORTI™ leverages PostProcess’ proven submersible technology for consistent, hands-free support structure and resin removal on 3D printed PolyJet, FDM, SLA and CLIP parts. The FORTI addresses the growing market demand for a software-driven finishing solution between PostProcess’ desktop-sized CENTI™ solution and production scale DEMI™ solution. 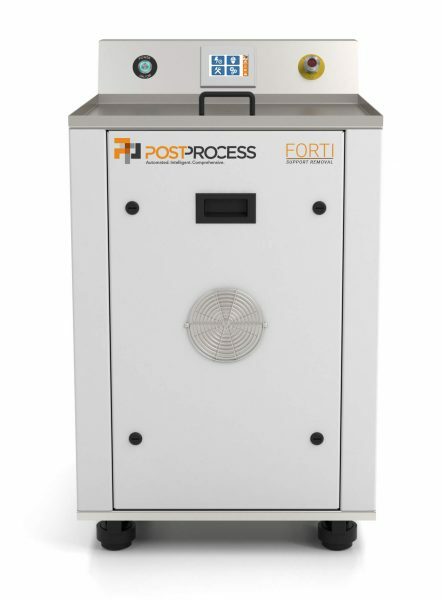 Enabled by PostProcess’ patent-pending AUTOMAT3D™ software platform, the FORTI system’s highly engineered Submersed Vortex Cavitation (SVC) technology utilizes advanced ultrasonics, heat and fluid flow in concert with proprietary additive formulated chemistry. An advanced pumping scheme creates vortex action to optimize the rate of removal of the support material and minimize buoyancy issues to virtually eliminate damaged parts. With user-friendly software controls, operators have control over key process parameters and the ability to optimize cycles to produce consistent end parts via the system’s pre-designed agitation levels. In addition to the new FORTI solution, PostProcess has also released the next generation of its popular RADOR™ automated surface finishing solution. The next gen RADOR utilizes PostProcess’ AUTOMAT3D software platform to customize agitation levels and optimize process cycles to achieve the desired Ra (roughness average) for a wide range of 3D print materials. Designed specifically for additive, the RADOR solution dramatically reduces attended technician time for finishing, especially in applications with high touch times such as with rigid materials. Suitable for a lab environment due to minimal sound and vibration, the RADOR solution can also be used in for in-line production. Both the FORTI and RADOR solutions will be on display at the AMUG (Additive Manufacturing Users Group) Conference in Chicago, March 31 through April 4th, in PostProcess booth P21.